In the summer of 2006, there was one movie everyone was on the edge of their seat waiting for. People stood in lines at 5PM that stretched a block to get into the midnight screening, and even going to an afternoon screening on Sunday was somewhat of an ordeal. Yes, this film was Pirates of the Caribbean: Dead Man’s Chest. I can’t really explain the hype surrounding this film; you had to be there. Hopefully you were, as this film only came out 10 months ago, but suffice to say, the hype was incredible, as it should have been. The Curse of the Black Pearl was the surprise hit of 2003, in more ways then one. Critics loved it, audiences loved it, and the bank loved it. I certainly didn’t expect it to be so good, but it was easily one of the best movies of the year, probably only second to the final chapter of The Lord of the Rings. So, the question is, did Dead Man’s Chest live up to the hype? Yes. Absolutely. Was it better then the first film? No. But never go into a sequel expecting it to be better then its predecessor. They often are, but they usually aren’t. Really, Dead Man’s Chest gives me everything I wanted out of a Pirates sequel, which is 2 or more hours of swashbuckling, high-seas fun, and it delivers this in droves. Honestly, you’d be crazy to follow up a film as good as Curse of the Black Pearl, but the filmmaker’s, like Jack Sparrow himself on so many occasions, were crazy enough to try, and they really pulled it off. The plot is very much in the spirit of the first film. 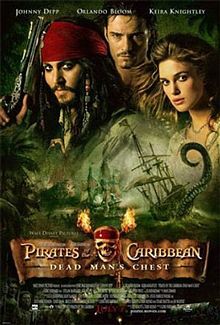 Jack Sparrow (now the unchallenged main character---he shared the spotlight with Will Turner in the last film) has a debt to pay to Davy Jones. He owes Jones 100 years of service on his crew, or he will be taken to the depths by the vicious Kraken. Naturally, Jack Sparrow will never give his soul to Jones, but at the same time, he doesn’t like the idea of the Kraken. What’s a pirate to do? The first 45 minutes of the film are all about Jack trying to figure out what to do about the mess he’s gotten himself into. This plot is intertwined with the plot of the arrival of Lord Cutler Beckett to Port Royal. Beckett is a by the book, power hungry guy who has an arrest warrant for Will Turner and fiancé Elizabeth Swan. When charged with the death penalty, Will decides to help Beckett in exchange for immunity. Beckett wants him to find Jack Sparrow and retrieve his mystical compass. Will goes and finds Jack on an island where the inhabitants think Jack is their god, and they must remove him from his fleshy prison by eating him. A nice, twenty five minute action/escape sequence begins. It’s tons of fun, but at this point, the viewer has no idea where the heck the movie is headed. Finally, the crew escapes and goes to Tia Dalma, a strange but fun to watch Shaman who reveals the plot of the film, basically. This is at the fifty minute mark, and is my one big complaint about this movie. While the whole Cannibal Island plot is loads of fun and its nice to see the plots being set up, it shouldn’t take fifty minutes to get to the main plot. It think twenty minutes could have been sliced out of the beginning of the film for the better, but its not a really huge complaint. The opening scenes are in no way boring, so the slow reveal of the plot is at least passable. Tia Dalma reveals that Jack needs to find the Dead Man’s Chest, the chest literally containing Davy Jones’ heart. If Jack finds it, he will have the leverage to make Davy Jones leave him alone. The rest of the film is the search for (and the battles over) the Dead Man’s Chest. It turns out everyone wants this thing (and I mean EVERYONE) so getting it certainly isn’t easy. But for the audience, it couldn’t be any more fun. The plot takes many twists and turns as the Chest continually changes hands, finally ending up in the hands of the person you don’t expect. Dead Man’s Chest plot is as solid as that of The Curse of the Black Pearl, but as with its predecessor is fueled by the excellent action scenes, which it delivers in droves. The last 45 minutes of the film is almost nonstop action that keeps you on the edge of your seat. I’d say there are definitely action sequences in this film that top scenes in the first movie, the best of which a huge, three way swordfight spanning an entire island, intertwined with an army of Davy Jones trying to get the chest from Sparrow’s crew. This is one of the best swashbuckling scenes ever caught on film, seriously. The special effects in this film are also the best I’ve ever seen in a movie, hands down. There is only one shot where you can tell the effects are CGI in any way, and the shot just so happens to be a pile of fruit. Davy Jones and his crew, including the awe inspiring Kraken are all CGI, but you’d never know if you didn’t already have the knowledge. Dead Man’s Chest obviously won the effects Oscar this year, and I’m surprised any other movie was even nominated. The effects are just unbelievable. What holds the film together, of course, is the acting, which is all great, with one exception (which I’ll discuss later). Johnny Depp is Captain Jack Sparrow once more, reprising what could be one of the best character performances of the decade. Depp has said many times this is his all time favorite roll, and boy does it show on screen. He simply IS Jack Sparrow. There’s no separating the two. Orlando Bloom returns as Will Turner, and while his performance is nowhere near as inspired as in the first film, it’s very good and he plays his part more then adequately. All of the cast from the original film returns as well, all playing their parts with as much fun and enthusiasm as they did in the first film. Newcomer to the series Bill Nighy plays Davy Jones, and he easily matches Barbossa in terms of excellent villain. He makes you believe this CGI creature is right in front of you, and is simply the guy you love to hate. The other newcomer, Stellan Skarsgard plays Will Turner’s twice cursed pirate father Bootstrap Bill, and does it with a great amount of grief and sadness that makes the character an almost tragic hero. But one actress almost ruins the movie in many scenes. Yes, I’m talking about Kiera Knightley. She was pretty good in the first movie; nothing special, but perfectly adequate. That’s very, very different in Dead Man’s Chest. She’s simply awful in every scene she’s in, and she’s given way to much screen time. There’s a scene (that I can thankfully fast-forward on DVD) where she tries to get a swordfight to stop by yelling at them, pretending to faint, and finally getting fed up and acting sarcastic, and I daresay this could be the worst-acted scene of the year. I could go on and on, but suffice to say, she didn’t even try to do a good job acting this time around. Basically, Dead Man’s Chest just doesn’t disappoint. Its main problem is its length; while the first one needed 2 and a half hours to tell its story, Dead Man’s Chest could cut 30 minutes (mostly annoying and unnecessary Elizabeth subplots) and you wouldn’t miss them. It’s an excellent 2 hour film trapped in a really great 2 and a half hour film. The plot is solid, the acting is solid, the action and SFX are top-notch, and the ending is unbelievably excellent. I can’t wait for At World’s End, and I’m holding my breath hoping it catches the ball and runs with it.